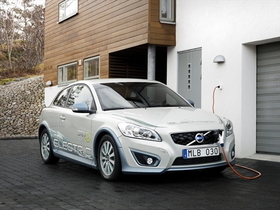 The Volvo C30 electric car has a range of 150km. Volvo's C30 electric car will come to California next year as part of a test fleet, said Stefan Jacoby, CEO of Volvo Car Corp. Speaking at last week's Los Angeles auto show, Jacoby said that it's too early to say now many cars may be run in California but that they'll go to commercial fleets. He said they may later go to private users. Jacoby said Volvo also will introduce a plug-in hybrid in 2012 that will come to the United States after 2013. In October, Jacoby said Volvo plans to have a European test fleet of about 1,000 electric C30s. He said that Volvo's home market, Sweden, and its neighboring Nordic countries will get the electric vehicle first. He said the automaker also aims to launch the EV in the UK, Germany, Belgium and China next year. He said the C30 DRIVe Electric, which has a range of 150km (about 93 miles), is a mature product that has all the safety features that Volvo customers expect as well as go-kart-like responsiveness.